Home » baby food » How do you know which baby food stage your baby is ready for? How do you know which baby food stage your baby is ready for? I would like to know how a parent determines when their baby can start baby food and when to go onto the next stage of baby food. 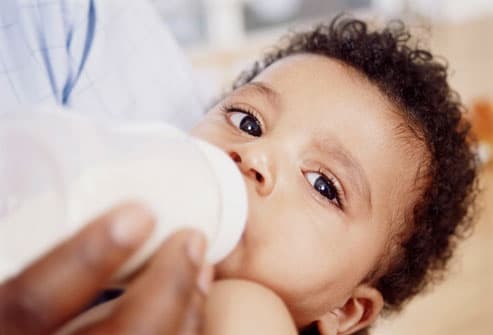 Also does this interfere with a mother exclusively breastfeeding her baby, meaning does the baby begin to nurse less from his/her mother when they are eating baby food? In all reality there is no real need for "baby food - purees" You should go by what your child can handle and when they are showing the signs of readiness for solid foods. And reaching 6 months of age. Babies have an open gut system prior to 5-6 months of age and so solids can be hard on their system if their gut is still considered "open"
My daughter hated purees and cereals so we went to Baby Led Solids/Baby Led Weaning. Check it out, its a great method of starting and incorporating solids! I breastfeed my daughter as well. So the important thing to know about breastfeeding and solids is that breastmilk is higher in calories and "good stuff" than a jar of baby food. So ALWAYS nurse first then offer solids as a complimentary to the nursing session. I would usually nurse and then an hour or so later offer solids. Once they turn a year old you can start to reverse and offer solids first and then nursing as long as the childs weight gain stays on target.